Today was lovely and sunny. The sun shone brightly, and in particular, on our veteran digger Mic, who is working in the annex to Structure Twelve. 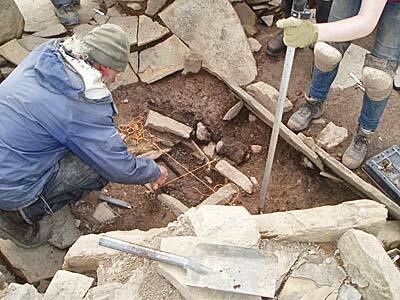 Mic excavates the cist in Structure Twelve’s annex. Mic is a good example of the flexibility of the modern digger. 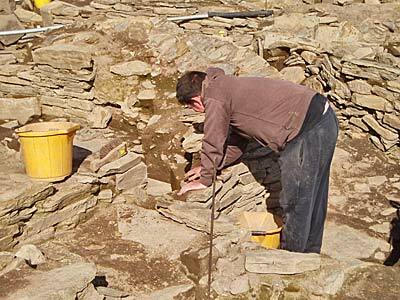 Just before coming to the Ness he was digging at The Cairns, an Iron Age site in South Ronaldsay, Orkney. Although the techniques are obviously the same, the switch from Iron Age to Neolithic can be unsettling, to put it mildly. However, nothing will divert Mic and his work in the annexe certainly showed dividends today. Excavating part of the floor, he came across what appeared to be a cist with a capstone. Around about it there was a high-quality hammerstone, a polishing stone and a quantity of nice pottery. The capstone sealing the deposits was lifted this afternoon, only to reveal another lower capstone. The area has now been sectioned for careful excavation and recording, including the substantial pottery visible just to one side of the cist. Over in Structure Twelve, the removal of the baulk across the middle of the building is continuing. The central baulk in Structure Twelve is almost removed. We have already mentioned how this work is changing the spatial perception of the structure but, as the work progresses, the immediate impression of the building is changing quite remarkably. Obviously, this is, in part, a matter of perception, but as supervisor Jim points out, the fact that there are fewer pier divisions in Structure Twelve when compared to some of the others, heightens even further the sensation of being in a large and airy building. In the matter of confirming existing impressions, Owain’s excavations in the midden between Structures One and Twelve have made even more apparent the evidence for earlier structures under the midden, with walls lines potentially running under Structure Twelve. In Structure Ten, Mike has continued to investigate his corner buttress, dispelling today the idea that it may have incorporated an episode of rebuilding. Interestingly, it now appears to be a single-build. Further along the south-west wall, Claire and Jan have carried out more excavation in the area of the robber trench, illustrating today that the stone robbers had been exceedingly busy, all those years ago, and had removed some very substantial stones indeed from the structure wall base. Bone specialist, Kerry Harris, had carried out initial work on the large bone spread around the “foundation” stone and pot in Mike’s corner buttress. Today, our own bone expert, Dr Ingrid Mainland, came on site and confirmed Kerry’s analysis, while adding that the single bone found inside one of the pots in that location is, in fact, a neo-natal cow bone. That makes this group of finds even more interesting. 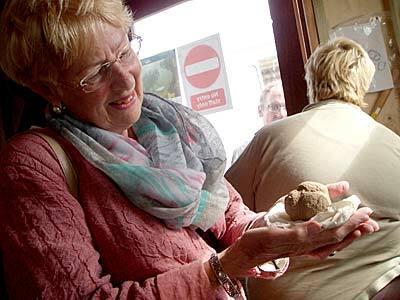 Babette cradles the stone ball just before it is sent south for conservation. Our visitors today included Dr Euan Mackie, the distinguished Scottish archaeologist, who took measurements of building alignments for his own research. Also here was Babette Bartlemass, the well-known artist (and scientist), who has carried out valuable work at the Ness in recent years. Babette, who is always a delight to welcome, had her photograph taken with our amazing carved stone ball. Elsewhere, a film company arrived to make promotional films for VisitOrkney and VisitScotland. However, they missed our on-site geologist, Martha, who is gradually disappearing behind a vast pile of rocks. Her contribution to our understanding is already immense and we heartily advise every excavation to have a Martha (but they are not getting ours). Hi-ya! My name is Jessica. I am studying archaeology and classical studies at Willamette University. And I am Madeline. I am studying at Whitman College, but this summer I am with the Willamette University program. Joe and Garnet conduct XRF in the middens to complement the micromorph studiies. The past three-and-a-half weeks we have been working in Trench T. We love you, Trench T! From the very beginning we have transformed tiny little T practically from topsoil with some rocks poking out, to a retaining wall, a massive rubble pile, and the “Crack of Doom” in the sondage (Very Indiana Jones). 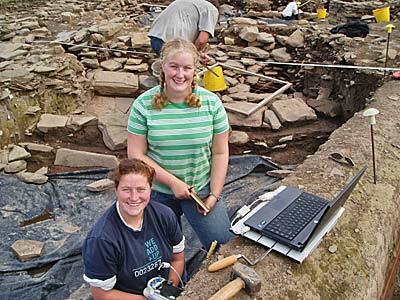 Besides excavating at the Ness of Brodgar, the Willamette students have also taken some field trips to other Neolithic sites around Mainland Orkney. Most recently we visited the Standing Stones of Stenness, Barnhouse, and Maeshowe. Every day, we drive past the Stones on our way to work, a ring of originally twelve giant standing stones. For thousands of years this monument has been part of the landscape, a spot for people to congregate and stare on in amazement; but also surrounded by everyday life, such as grazing sheep. That’s one of the weirdest things about Orkney. When you see pictures of these places, you get the idea that they are separate from people, and life. But when you get to Orkney you realise that they are incorporated in daily life as much now as when they were first built. Stewart starts to remove the blocking in the southern entrance to Structure One that relates to its later phase of use. After seeing the Stones of Stenness from a distance for so long it was amazing to see (and touch) them up close for a change. There are only a few stones standing now, with a hearth in the centre. Nick, who served as our tour guide, told us that archaeologists found lots of burned animal bone, which suggested that the site was a “temple of the living,” as opposed to the Ring of Brodgar which might have been more of a “temple of the dead,” because of the lack of activity. After visiting the Stones, we also saw Barnhouse – a Neolithic settlement village discovered by the archaeologist Colin Richards (and his dog). 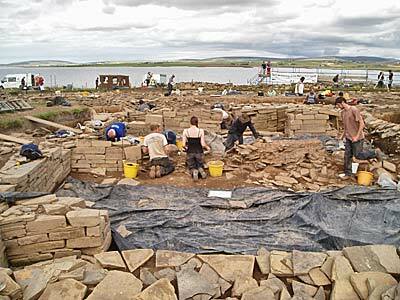 It was interesting to see this site, and draw comparisons with our own Ness of Brodgar. We wonder if citizens of Barnhouse came to the Ness to visit, trade, and conduct meetings? Finally, Maeshowe. Nick was lucky enough to get us in so late in the day (after visits had ended on site). We were given the story of the small, domed chamber, thought to be a Neolithic tomb. There is more to Maeshowe than that, though. The tour guide showed us several marks of graffiti from vikings. A hundred of them once spent the night in the cramped, dark quarters. Some of the carvings you find there are interesting, like one of a dragon, a walrus, and an intertwined snake. There are also Neolithic graffiti marks that look a lot like our “Butterfly Stone”. Now, though, we are finishing up the season’s excavations. Both of us have been doing final plans of Trench T the last few days, so that all the archaeologists know what the space looked like at the end of the season. Hard to believe that in a few days we won’t be working at the Ness any more. We have learned so much, from the basics (where to put your trowel when you’re not using it [back pocket]) to the most important and complex tasks (context sheets!). It has been a privilege to work in such an amazing place, and meet all the people who have discovered the secrets and are endeavouring to understand the mysteries of the Ness of Brodgar. We think we speak for all the Willamettes when we say we’ll miss you. Thanks for the opportunity!